Artisan Pizza Crust with Whole Grain. I kept sampling the tiny bites of crust spread with cream cheese, spinach, tomatoes and onions. It was so simple, yet so pleasant to my taste buds. 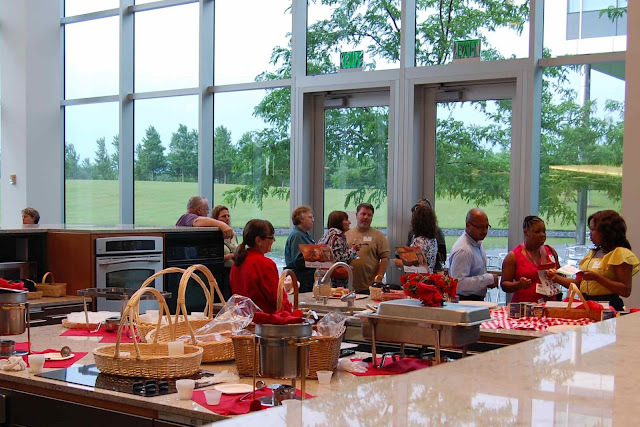 If you look at the picture below, taken from the General Mills blog, you can see me, along with fellow members of the Box Tops for Education Panel, hanging out at the table. The server probably wanted us to stop eating all of her samples. Ha! Who doesn't like pizza? I could probably live off of it a few days out of the week. It's the unofficial food of the college student too. You can eat it cold, old, hot and just about anyway you can imagine. I've been known to spice up leftover pizza from time to time. It's my go-to food when I need something quick and easy. Now, I'm incorporating it into a fun after school snack for my son. Kaden is a growing boy. 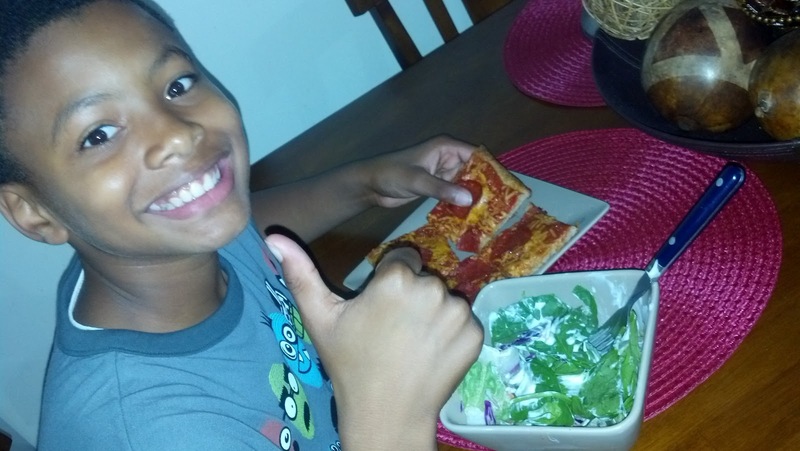 He has an appetite like his Dad – big! At one time I could hold him over with a fruit cup or something small. Now, he basically needs a meal before dinner time. I'm not the best cook in the world. I can make the basics and read a recipe here and there. I blame it on the fact that I have so many wonderful cooks around me. They like to cook, so I'll just sit back, watch and eat. You'd do the same thing. But after school, I am on my own. When Kaden says he is hungry, I have to think of something quick and easy to give him. I decided a pepperoni and cheese pizza would do the trick. First, I started with basic ingredients. 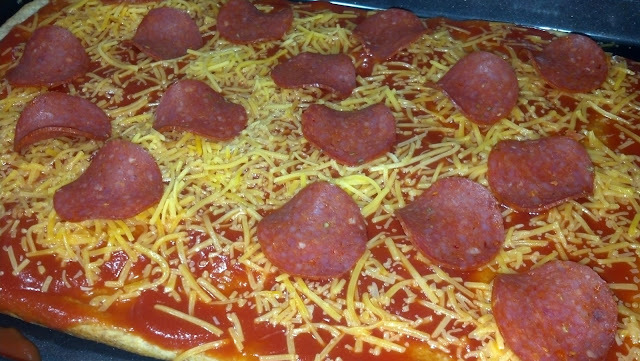 I used Pillsbury Artisan Pizza Crust with Whole Grain, tomato sauce, shredded sharp cheddar cheese and pepperonis. The topping are endless. Decide exactly what your child wants to put on theirs. Make it fun. 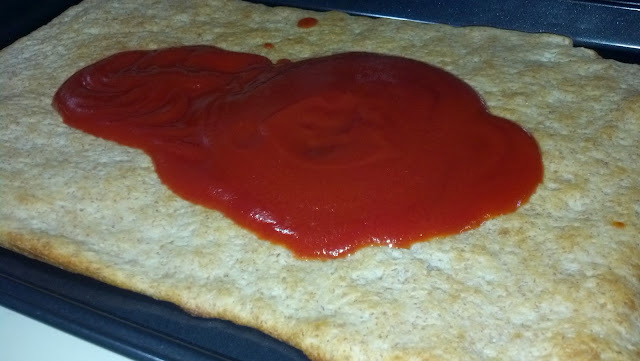 Once you have preheated the oven to 400 degrees and greased your baking pan (different depending on the type), crack open your pizza crust. Once you pop the container, DON'T YOU DARE FORGET TO TEAR OUT THE BOX TOP for your child's school. 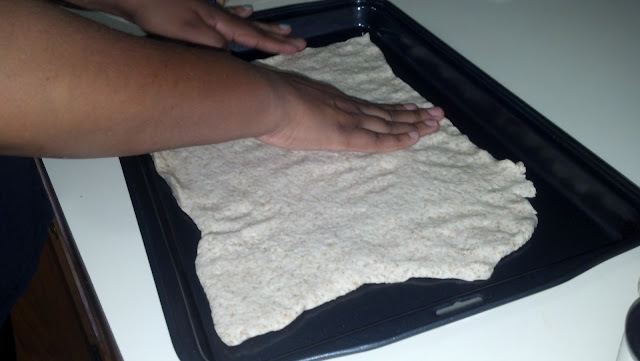 Unroll the dough on the baking sheet. Press it with your fingers until you reach your desired thickness. For fun, you can use a cookie cutter to make cool shapes for mini pizzas. I just chose the traditional route. 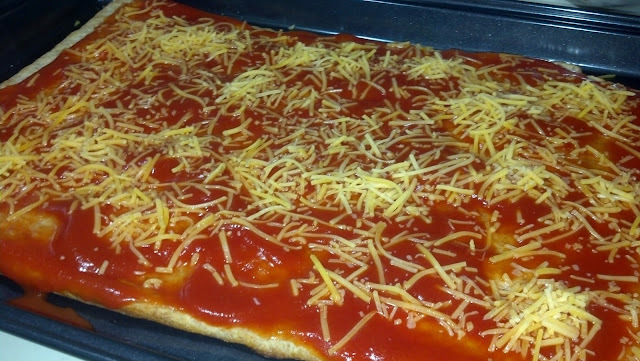 Place the plain pizza crust in the oven for a pre-bake for approximately 8 minutes. Once this is done, remove the pizza crust from the oven. 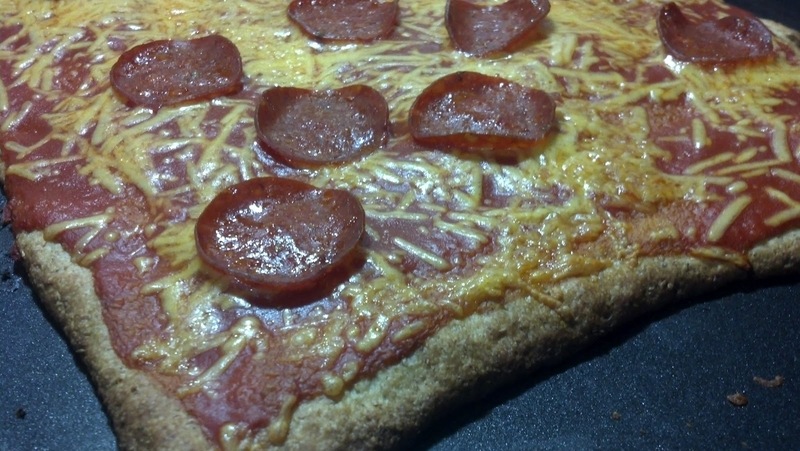 Add your tomato sauce and other toppings to the pizza crust. Place the pizza back into the oven for approximately 6 to 10 minutes or until the crust is golden brown. Keep an eye on your pizza. You don't want it to burn or turn out too crispy. When you're done, it should come out looking great and smelling delicious. Kaden can be a picky eater at times. Lucky for me, the pizza was a hit...or either he was hungry. Either way, he ate it all. I added a salad to make sure his belly would make it to dinner. I told you he could eat. 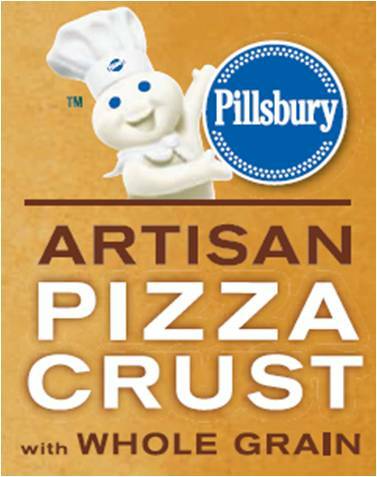 Want to see if you can satisfy your family's appetite with Pillsbury Artisan Pizza Crust with Whole Grain? I have a quick giveaway just for you. 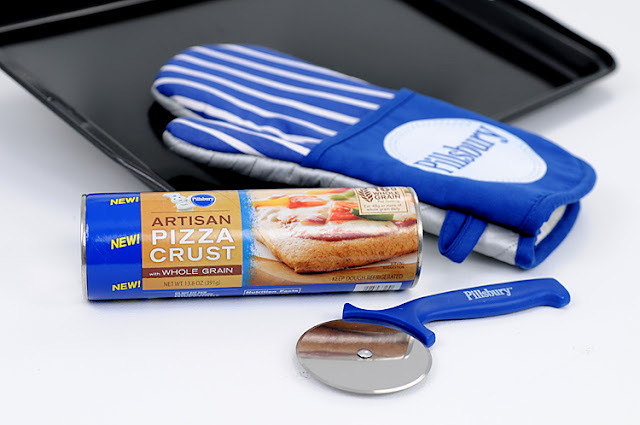 What do you plan on making with your Pillsbury Artisan Pizza Crust with Whole Grain to bring the whole family together for dinner? Mini pizzas? An entire pizza? Pizza Rolls? You decide. Leave a comment below with your answer. Be sure to leave an email address so that you can be contacted if you are the winner. Giveaway ends 10/7/2012. Open to US Residents age 18 and older. One entry per household. Please leave a valid e-mail so that you can be contacted if you are the winner. Winner will be chosen using Random.org and will have 48 hours after receiving an e-mail from site owner. Sponsor is responsible for mailing the item. 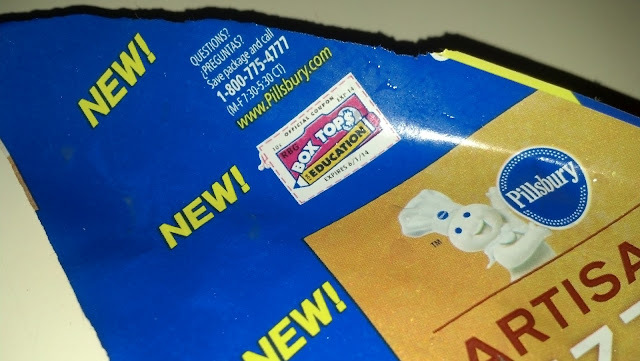 The product, gift pack, information, and additional sample have been provided by Pillsbury through MyBlogSpark. Opinions and views are my own.